Quartz, or engineered stone, countertops have become a popular choice in recent years. If you love the look of granite, take a look at this countertop material. There are far more color choices available than with natural stone; and while quartz countertops look like granite, they are easier to maintain. Quartz countertops have a natural radiance that will capture your attention. Quartz is a hard mineral that forms in clusters rather than large pieces of stone. Therefore, it cannot be cut into slabs, but it works well when crushed. Quartz countertops are produced by combining ground natural quartz with a resin plus binders and the desired colorant. A ratio of 93% quartz to 7% resin is generally used. Different appearances are achieved by the level of fineness to which the quartz is ground. Coarsely ground granules produce a more flecked appearance, while finely ground quartz produces an even-grained look to the final countertop. A quartz countertop is a dense, nonporous surface that is consistent in color and texture. It is tough and hard, and it can be fabricated in slabs big enough for a one-piece island or for larger countertops with curved edges. Various edge shapes can be fabricated into the countertop slabs. Unlike solid surface material, seams will show on these countertops. Seams are similar to those for other natural stone countertops, but the seams are generally less visible because there is no variation between slabs due to its consistent pattern. Sinks of this material, integrated into a countertop, are not available. 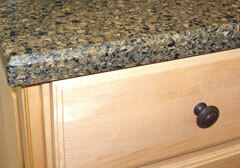 Quartz countertops are food-safe, and they do not stain or etch when oil, grease, or acid is left on them. Some brands of quartz countertops come with built-in Microban, which deters the growth of bacteria. Other quartz countertops are certified by the National Sanitation Foundation International for use in commercial kitchens. 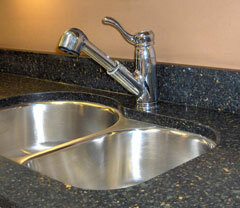 Clean quartz countertops with water and mild soap or detergent. You do not need to seal these countertops like other natural stone surfaces. Quartz countertops are heat resistant, not heat proof, so don't place hot pots, pans, or bakeware on them without a trivet or protective hot mat. 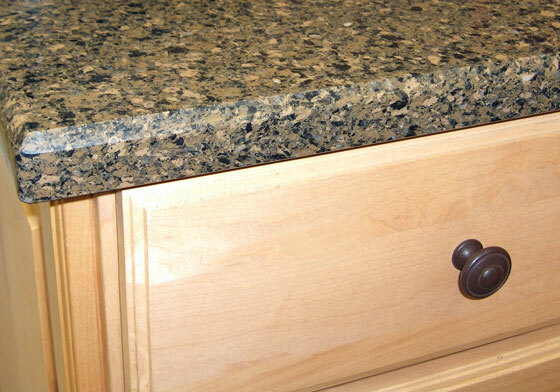 Quartz countertops are heavy, so make sure your cabinets are able to handle the quartz countertop weight. To retain your warranty, a professional, trained and certified by the manufacturer, is needed to install this product. Most manufacturers offer a 10-year warranty, which is rarely found with other types of countertops. The following manufacturers produce quartz countertop material. Browse through their websites to get a complete picture of the features of these exciting countertops. You will be dazzled by the array of colors and natural, stone-look patterns that are offered. Zodiaq is a smooth, nonporous countertop material that is composed of quartz. It is durable, heat-resistant, and scratch-resistant, and it retains its finish without sealants. Silestone produces one of the most desired natural quartz countertops. They have a dazzling array of colors to meet every wish. The original polished surface is popular worldwide. Cambria is a practical and elegant natural stone surface. It is maintenance free and food safe, which makes it suitable for both home and commercial uses. CaesarStone has manufactured their quartz surface and countertop products since 1987. They offer what they feel is a better alternative to natural stone. Technistone provides high performance quartz countertops. Its quartz surface is more durable than natural stone and is a hygienic, easy-to-clean product. Verona Marble Company produces Legacy, a quartz countertop material that is suitable for commercial or home use. This product may also be used and floor tiles or wall panels.